One of the most important responsibilities of any facility's management is to keep employees safe. Each facility will have a different list of potential hazards to address, and properly addressing them will protect employees and contribute to the facility's future success. One safety hazard that virtually every facility will have is electrical hazards. The discovery and harnessing of electricity have done more to change the world than just about anything else in history. Electricity has also introduced a wide range of potential dangers that really didn't exist before its widespread use. Taking electrical safety seriously in your facility will help you to get all the benefits, while minimizing any risks. Whether you are opening a new facility or you're looking to improve safety in an existing one, the following ten electrical safety steps will give you an overview of what needs to be done. Going through each of these steps will help lay the groundwork for safety improvements that can occur immediately and benefit the facility long into the future. Whenever you undertake safety improvements in your facility, one of the first things you should do is look to OSHA and other organizations that emphasize safety. These organizations are dedicated to identifying proven safety strategies used around the world and helping companies implement them properly. OSHA is more than just an organization that helps companies improve the safety of the workplace, though. OSHA is a division of the United States Department of Labor, and it has the power to issue penalties and fines if a facility is not in line with OSHA requirements. With this in mind, it makes sense to start any electrical safety program by making sure you are compliant with OSHA electrical safety standards. To start with, look at these tips from OSHA to set the stage for how you can avoid electrical hazards in your facility. Assume Wires Are Energized - Employees must work under the assumption that all electrical wires are energized at lethal voltages. Since electrocution can be deadly, it is safer to err on the side of caution. Leave Power Lines to Professionals - Inform employees that they should never touch power lines themselves. Only trained electricians with the tools and experience, and personal protective equipment needed to stay safe should ever work on these wires. Be Aware of Water (and Other Conductors) - Employees must know of the added dangers of working outdoors near water or other conductors. Standing in a puddle can leave you much more vulnerable to electrocution. If a wire falls in the water, electricity can instantly travel to your body. All Repairs Must Be Performed by Electricians - All too often electrical wires such as extension cords get frayed or damaged. Many people assume they can wrap a cord in electrical tape and move on. However, this type of damage should only be fixed by an authorized electrician who can ensure the repair is done according to safety regulations. Centers for Disease Control and Prevention - The CDC is another government agency and while its main focus is not electrical in nature, it does offer some good tips for getting started with electrical training and overall safety when working with energy and electricity. National Fire Protection Association (NFPA) - The NFPA is one of the best known associations for keeping homes and businesses safe from fires. Since electricity can quickly cause fires, the NFPA is another good resource for learning about electrical safety. Insurance Companies - This is an often overlooked source of information. Insurance companies are very interested in minimizing the risk of disaster since they will often be the ones paying for it. They frequently publish studies, recommendations, and tips about electrical safety. Once you understand the requirements for your facility, you will need to identify areas that need improvement. One great way to do this is to set up Gemba walks. These walks involve you or someone from your team going out to the different areas of the facility and looking for improvement opportunities. "...you will need to identify areas that need improvement. One great way to do this is to set up Gemba walks." Traditionally Gemba walks are done to look for types of waste or ways the facility can become more productive. In this situation, however, the person doing the Gemba walk should focus on looking for electrical safety hazards. 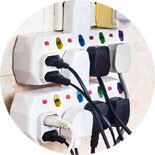 Many electrical dangers can be traced back to an employee being careless. 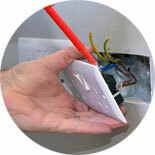 For example, working near an electrical source with wet hands can lead to serious shock or even death. Watch for employees making common mistakes to see where additional training may be needed. If an electrical outlet is located near a source of water or another conductor, it presents a hazard. An easy safety solution is to use ground-fault circuit interrupter (GFCI) outlets, which can disrupt the electricity should it be necessary. This is perhaps the most common safety issue. Cords are frequently pulled, scraped, run over, and otherwise experience wear and tear. Over time they can become cracked, torn, or frayed. This is a significant safety risk. 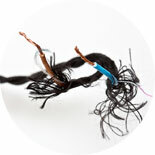 Damaged wires must be professionally repaired or replaced. 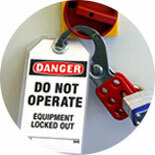 Lockout Tagout is a proven way to keep people safe while working on machinery. If your facility has not properly implemented this system, it is worth investing time in doing so. When you have a higher electrical demand on a single outlet or circuit than it can handle, it can be dangerous. This can cause issues with overheating, damage the devices plugged into the outlet, and even lead to fire hazards. Your facility should closely monitor the electrical requirements of each outlet and circuit to ensure they are not overloaded. There will be many other safety hazards related to the electrical systems of your facility. Taking time to walk through with a close eye on electrical hazards will help you identify areas that can be improved. When on your electrical safety Gemba walk, remember to look beyond major risks. You should identify even small hazards or behaviors that can lead to danger. Eliminating a lot of minor risks can provide your facility with significant safety improvement overall. Whenever you want to improve your facility, it's wise to look to industry best practices. Best practices are proven techniques that have been tried and found effective by many kinds of facilities. While no practice is going to be 100% perfect, you can benefit from learning from the experience of other professionals in the industry. Start by identifying and implementing electrical safety best practices. Once you have implemented these practices you can (and should) keep looking for improvement opportunities. When researching best practices, you will likely run across a wide range of options. 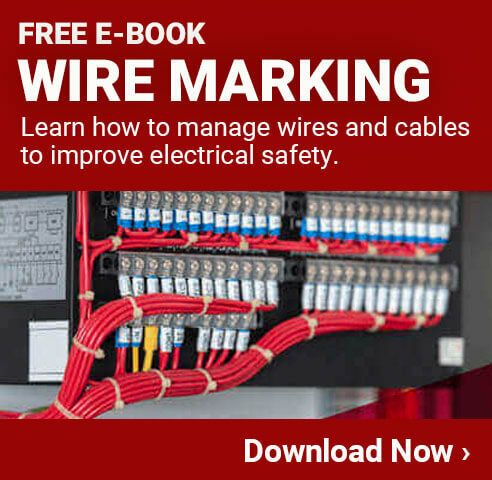 There are best practices for running cable wire, offering electrical services, using personal protective equipment (PPE) and safety equipment, using wire makers, and much more. Determining which of these practices will benefit your facility can be difficult, but it is worth the effort. 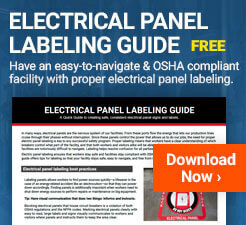 Most facilities will use tools such as electrical safety signs, tags, and labels, so learning about best practices related to visual communication tools is essential (you'll learn more about them in the visual communication portion of this report). In almost all situations you will be able to evaluate electrical best practices to see whether or not they will work in your facility. If you try them and they don't work out for some reason, they are not required by law. You can always stop using these practices or make adjustments. The next step to improve the safety of your electrical systems is to perform a full audit on a regular basis. Don't confuse this with the Gemba walks discussed above. This is a completely separate effort, but one that is just as important. Performing a full audit of your electrical systems allows you to look at specific areas where hazards may exist. Most facilities should perform this type of audit once per year to ensure everything is still operating safely. If you have never performed an electrical safety audit in the past, you will need to create a detailed checklist of what to inspect. There are generic lists available to start with, and then you can customize them based on the specific needs of your facility. While conducting an audit of your own facility can be beneficial, electrical audits should ideally be performed by an independent third party agency that specializes in these hazards. Professional electrical audit companies will have advanced tools and equipment to test your machines, wiring, and other components of your electrical system. By working with a third party provider, you will also get the best information possible from an objective source. Once the audit is completed, you will be given a list of areas where you can make improvements. This will help you determine where you can best invest your resources. In many cases the auditors can also provide you advice about the changes you could make. No guide for electrical safety would be complete without discussing personal protective equipment (PPE). Most facilities will have many types of personal protective equipment on site to help keep people safe. This includes hard hats, respiratory protection, eye protection, and gloves. For electrical safety, flame-resistant (FR) clothing, a hard hat, and safety glasses are often required. If you don't have equipment to protect people from electrical hazards, you are doing your employees and the entire facility a disservice. When providing PPE for your facility, make sure you have the right equipment for the situations your employees will face. If you offer PPE that will not provide sufficient protection for a given task, it can actually make an incident more likely. This is because people may assume they are protected from all electrical hazards when that may not be the case. No matter what level of risk is present, being aware of the dangers and taking necessary precautions is extremely important. Taking risks when working around electricity can be deadly. When there is doubt about the level of electrical risk present, you should err on the side of caution. While many of the electrical improvements you undertake will involve electrical equipment, that should not be the only area of focus. Providing your employees with a clear safety program and detailed training also plays a key role in electrical safety. You can give all employees basic electrician courses, for example, so they will have a general understanding of the risks associated with electrical systems and how to avoid them. This will also allow them to help spot risks throughout the facility. This is critical because employees will be out on the floor much more often than anyone else, making them the first line of defense against safety hazards. Remember, it isn't just electric companies that have to have electrical safety programs in place for their employees. Just like fire and safety programs are for everyone and not just firemen, so too are electrical safety programs. If you're looking for simple and inexpensive solutions to improve electrical safety in your facility, start by looking into visual communication strategies. Visual communication for electrical equipment includes things like cable tags, cable labels, wire markers, fire safety signs, hazard signs, and more. Putting up labels, tags, and signs that illustrate the risk to those in the area is an easy way to highlight electrical hazards. When you have an industrial label printer available, you can create these items as you need them. High-quality labels and tags, for example, can be placed on electrical equipment or cabling to let people know the details of the voltage. You can also put up signs to alert people to the presence of arc flash risks. If you know the hazard level of an area, put up a large label near the entrances or exits of the area alerting people of the hazard. Then you can make labels that let people know what types of personal protective equipment they need when entering the area. Using visual communication strategies for electrical safety is surprisingly effective, but it is often overlooked by facilities because of its simplicity. As you are likely aware, visual communication strategies have been used for generations for many different applications, and facilities continue to use these strategies for electrical safety with much success. When you need to keep people safe near electrical hazards, there's no substitute for training. Finding the right electrical safety training options for your facility won't be difficult since there are so many courses out there. In addition to any formal training options you may find, however, you will want to make sure you also have customized training for your specific facility. For example, train the employees on when and where they need to wear personal protective equipment in your workplace. Then teach employees how to read and understand any electrical safety signs you have posted. The more you can teach employees about the dangers of electricity and how they can be minimized, the safer your facility will be. Start by implementing an electrical safety training class for all new employees. Once that is in place you can develop a refresher course or an ongoing training for those already working for the company. It is important to delve a little deeper into arc flash safety training. Of all the risks associated with electricity, arc flash and the corresponding arc blast are the most dangerous. Creating an arc flash program that covers both a high voltage arc flash incident and those at lower voltages can help minimize risk and save lives. What is arc flash? An electrical arc flash is a potentially deadly event where electrical current leaves the intended path and travels through the air. It goes from the electrical cable it was supposed to travel on to another or to a nearby ground. The result is quite violent and can destroy even large objects or throw them significant distances. If a person is in the area, he is at risk of serious injury caused by the energy released. Severe Burns - Clothing that is not fire resistant can actually burn onto the skin. This is why arc flash PPE is so important. Fire - A fire can ignite in less than a second and then quickly spread through the area. Flying Objects - Items that are in the "blast area" of the arc flash will be propelled violently through the air. Molten Metal - Any metal in the area will immediately melt, which can cause severe burns and start additional fires if it comes into contact with nearby objects. Blast Pressure - The pressure from the blast can reach up to 2000 lbs/sq ft, which can be quite deadly on its own. Sound - Arc flashes can reach noise levels as high as 140 dB, causing hearing damage. Dust - Dust can provide electricity a path with less resistance than a damaged cable, which can trigger an arc flash. Impact Damage - If someone drops a tool onto a cable that is split open, the electricity can escape through the opening into the tool and beyond. Condensation - Moisture near a normal piece of electrical equipment can make an arc flash much more likely. Corrosion or Rust - A corroded wire can result in an unintended electrical path. As the electricity reaches the end of the corroded area, it must escape somewhere, often resulting in an arc flash. There are other situations that can cause arc flashes, too. When there is a known risk in an area, employees must use extreme caution. Ideally the electricity should be cut from the area before work is performed. Even when there is no obvious risk, however, it is best to minimize exposure to an area where a severe arc flash could occur. Location - How close a person is to the location of the arc flash will directly impact the likelihood of electricity passing through a person's body or that he will be injured by objects thrown through the air. Temperature - The temperature of the arc flash can exceed 35,000 degrees Fahrenheit. This is an extraordinary temperature that can cause extremely severe burns in a fraction of a second. The temperature will depend on a number of factors, but even small arc flash explosions will have high temperatures. Duration - An arc flash will continue until the electrical supply is cut off, which almost always occurs because a circuit breaker trips. This will usually occur within a fraction of a second. Due to the severity of the event, however, even fractions of seconds can have severe consequences. As you can see, an arc flash is very dangerous. Taking the time to understand the risks and know the arc flash PPE requirements should be high on your list of electrical safety steps. Arc flash training requirements in your facility should be clear to everyone at all levels. Whether you perform arc flash training online or you have a training session conducted in the facility is up to you. Both can be very effective. The final step is essentially the beginning of the next cycle of improvement for the electrical safety of your facility. Even if you have made incredible progress by going through each of the previous steps in this document, there is always more to do. Unless you have completely eliminated every risk related to electricity, the task of improving electrical safety is not yet complete. Taking a step back and looking at all you have accomplished thus far is fine, but then it is time to get started again. This step can be considered the Kaizen of electrical safety. Be proactive and continually take steps to improve electrical safety in your facility. So whether you go back to the top and start at step one or choose to focus on a specific area for the moment, remember that electrical safety should be a primary concern for your facility at all times.